The next stop on our Labor Day road trip was in Santa Claus, Indiana at Holiday World. We spent two days at the park and had an awesome time. The new Thunderbird coaster looks awesome with the rest of the skyline. Now heading into the park. The Raven is a pretty awesome coaster to see as you enter the park. Several empty rows on the train, everyone was in the waterpark! The temperatures exceeded 90 degrees on this unseasonably warm Labor Day weekend. Merry Christmas from the first themed section of the park, the Christmas area. This section of the park is the first section that was built when the park opened under the Santa Claus Land name in 1946. Santa Claus Land is said to be the first amusement park built with a specific theme, Christmas. It is often argued that Santa Claus Land was the first true theme park for it was built with a specific theme. Previous parks had themed sections, but no parks had a park-wide theme before this. The claim for the moniker of "first theme park" is not one without contention though, for Knott's Berry Farm stakes a claim for the same title as well. Complete with a nativity scene. The park's dive show is a popular attraction. Sadly the CCI Legend, the coaster tied for my second favorite overall, was down for the weekend. Oh well, Holiday World has many other standout rides. The Legend is themed after Washington Irving's short story "The Legend of Sleepy Hollow." Here are several of Holiday World's standout coasters. In the foreground is Gravity Group's Voyage, my favorite coaster overall, with 1.22 miles of insanity. The 1.22 mile length is good for the 8th longest coaster in the world and 4th longest coaster in the country. However, we will get a ride on it later, we have to try out the brand new B&M orange steel behemoth in the background, Thunderbird. But did we like it? Click to find out! Spoiler alert: we absolutely love it! The Voyage is perfection with the strongest airtime in existence and some wild laterals. So the former Pilgrim's Plunge/Giraffica Intamin splashdown ride's landing pool still remains filled with water and the boats remain in the station. I wonder if they kept the disassembled ride and plan to rebuild it, or if they have something else in store. Now over to Thunderbird! Our speculation is that the bird of thunder is this hawk! One of the many cool things about Thunderbird is the way it shares the woods that the Voyage careens through. It works PERFECTLY with the wing coaster concept. As you may know, Thunderbird is the first launched coaster fully built by B&M. The Incredible Hulk at Islands of Adventure's launched lift hill was sourced out by B&M. Let's just say that this project came out incredibly. The best two words to describe this coaster are "fast" and "intense." The launch is extreme, the compact inversions meet and exceed the intensity of the early B&Ms like Batman. The layout has inversions and elements that you cannot predict. There are countless points where you feel like your feet or head will hit something, and it is incredible. I hear people compare this with the other wing riders and I think that it is an apples to oranges comparison for the layouts of the others are so different compared to this. Thunderbird is my favorite B&M and one of my ten favorite overall coasters including wood and steel, and my fifth favorite steel coaster overall. Similar to the other Holiday World stations, they thoughtfully kept most of the queue within the station structure, complete with fans to help cool off the people waiting. With their quick operations, there was never a point where the line movement even stopped. With classic B&M efficiency, this line, even at full capacity, never exceeded half an hour. This photo was taken at a rare moment where there was not a line. Just about twenty minutes after this was taken, the waterpark was letting out and the queue was full. During this break in the crowds we were able to get rides on each of the four corners over less than half an hour. The barn theming works perfectly, and the mid-ride barn creates some pretty intense moments on the ride. These tight inversions are tremendous. The inline twist into the brake run is awesome. The setting within the woods of the park led to both a thrilling experience in feeling like you were going to fly into the trees, and a disorienting effect when you headed into an inversion and could see the trees appear as if they are upside down. Did I say that the ride operations are awesome at this park? They also did such an awesome job with this station. Easily the best design I have ever seen, both in functionality and aesthetics. As soon as the second train approached the station, the next train was set to launch. They did an all around awesome job on this ride and they have added yet another world class coaster to the park. You are launched right into this140 foot Immelmann inversion. Now for some sunset Voyage action! Gotta get a moment's reprieve from the 90 degree weather in the Sally Rides designed Gobler Getaway, an awesome family-friendly themed dark ride with the target shoot bullseyes with "turkey callers." Now on to a final ride for the evening on this steel masterpiece. We finished our evening on the Raven. This is riding much better than it did last season for some reason. Tons of ejector air and wicked laterals. In the corner of the station you can see one of the reasons that the park is always recognized for awesome service. The park has come up with this platform to help individuals with physical limitations have the ability to more easily transfer into the train. This deserves serious recognition for the park and the lengths it goes to in order to ensure that everyone can easily enjoy their world class rides. We stayed overnight at the nearby Lincoln State Park. Abraham Lincoln spent his boyhood on his family's farm in this location from 1816 to 1830. The state park has a number of cottages that are really inexpensive. The cabin we slept in had two sets of bunk beds and one full size bed, with capacity for six people. This was the smallest of the cottages, with the larger ones sleeping up to twelve people. With prices ranging from 20-50 bucks a night, these are an awesome deal. They do not have air conditioning, but are located deep in the woods where it cools off pretty well. The cottage area also has a common area with a kitchen hall and campground style bathhouses. Now for day two! Raven woohoo! The dive down to the lake is pretty awesome. And back to these two world class coasters. As does Thunderbird. This place is truly a coaster heaven. The 60 MPH launch on Thunderbird is quick and intense. Now for a ride on Voyage! Gotta love these coasters, but this 92 degree day was definitely one to spend in the water. Thankfully the park has multiple waterslides that are as out of this world as their coasters, including two water coasters that are the two best waterslides ever produced. Wildebeest and Mammoth are the two longest Proslide Water Coasters, and they are incredible. Wildebeest just won best the "Best Waterpark Attraction" award in the Amusement Today Golden Tickets for the fifth straight year, with Mammoth polling in second. No other water ride comes close to how awesome these two slides are. Dehydration during this heat was never a concern either because the park has unlimited free soda. There I am, thoroughly thrilled after riding the Voyage, the ultimate roller coaster. The camera got a nice little break as we were in the waterpark. All of a sudden the sun is setting again and it is time to get some more coaster rides in. Looks like the squirrel found its nut. After another night with a campfire we started to head back to Pittsburgh. Our first stop was across the street from Lincoln State Park at the Lincoln Boyhood National Memorial, the site of a portion of the homestead where Abe Lincoln spent his formative years. They have a beautiful visitor center commemorating Mr. Lincoln. I am honored to have spent time on Labor Day at the place that Lincoln grew up and formulated his stances that changed the free world. Lincoln was a major advocate for human rights and an early advocate for labor rights. While the Emancipation Proclamation is one of the most important documents in the history of freedom, it is also hugely important in regards to labor history. It freed over three million people from forced labor and set the tone for eventual wins in labor. Here is a split log fence, similar to something that Abe Lincoln, a skilled carpenter, built on his farm. One more look at Holiday World before we hit the road! The park was testing the rides prior to opening on this beautiful Labor Day. From this direction you can see how the park actually built the Voyage to head out uphill and back going down hill. This enables the ride to pick up pace at the end of the ride. Thunderbird is an all around winner for the park and adds to their collection of coasters that are amongst the best in the world. 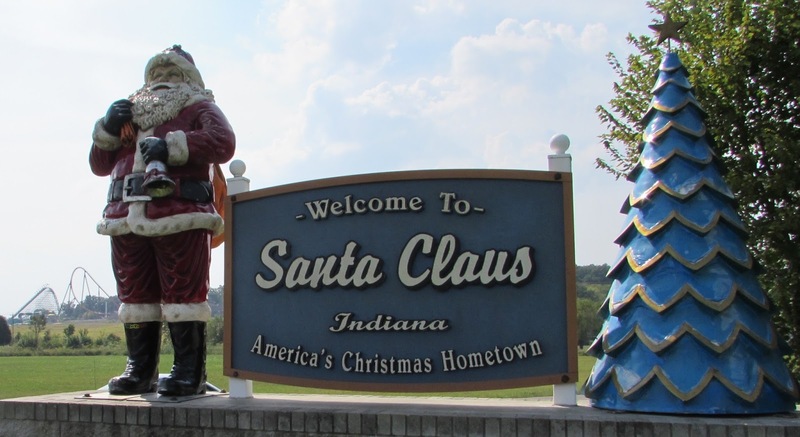 Well Santa, heading to your town, Santa Claus, Indiana, was worth the 7 hour drive once again, and we will be sure to repeat again. Now we will time travel back across the nearby Eastern and Central Timezone line and skip an hour. As far as the park goes, it has three of my ten standout favorite coasters, Voyage, Legend, and the brand new Thunderbird. Raven is lots of fun as well, and running tremendously. If you plan on visiting Holiday World, try to spend multiple days at the park. You will certainly want to ride their coasters over and over, and their waterpark, Splashin' Safari, is awesome.